Space museum located in Mountain View, California, U.S.A. The Ames Exploration Center exposes a real piece of lunar rock brought back to Earth by the Apollo 15 mission in 1971. You can also see an authentic Gemini capsule. Look at beautiful models like the SOFIA plane that loads a telescope, and also look inside a space station mockup. Watch some of NASA’s most exciting missions on the planets of the solar system. 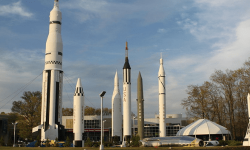 How to go to the Ames Exploration Center ?